From Honolulu International Airport to Waikiki, $13.00 rate per person. Infants under 2 year free. This is a shared ride, not private. Fly Shuttle's most selected Airport shuttle transfers are available from the Honolulu International Airport to a variety of Hotels and Condo in Waikiki with some of the lowest prices available on the Island. 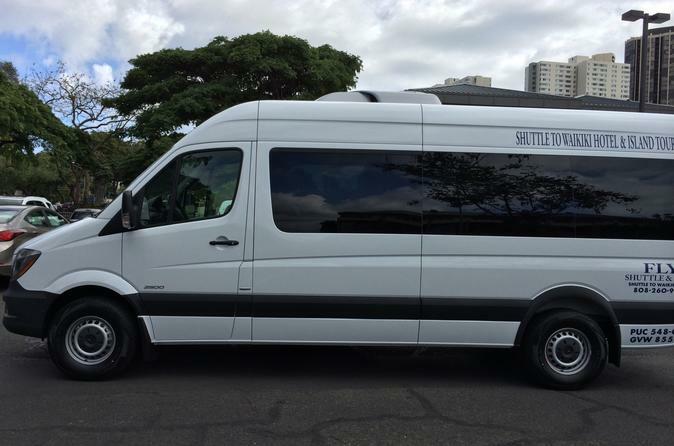 Fly shuttle offers this shuttle service with our fully-insured drivers who are guaranteed to be on time and to make your transfer to and from the Honolulu International Airport the most pleasant experience of your trip. This option and price is for a one way trip. Our shuttle is capable of carrying up to 14 passengers comfortably with enough space for all passengers and luggage. The rate will cover up to 2 luggage per person.